The cover of Palace Hotel by Michael James Chua. Palace Hotel is one of the stories in Halo: Evolutions - Essential Tales of the Halo Universe. Written by Robert McLees, it is a loose retelling of the events of the level Metropolis in Halo 2 with major differences in events and locales. The story, which is set during the Battle of Mombasa, follows John-117 as he makes his way to the heart of the city on a mission to board the Solemn Penance, from the other end of the bridge to a Marine outpost in the city where he meets a childhood friend. John makes his way towards the carrier after his Pelican has been shot down by a Scarab, but finds that the Mtangwe Underpass, the tunnel leading towards the carrier, is blocked. He finds a group of Marines led by Corporal Palmer and helps them escape from a Covenant attack supported by Wraiths. They escape into the city's old sewer system, and resurface near the parking lot of the Kilindini Park Cultural Center. They come across a battlefield with Covenant troops still in the area, but also serviceable Warthogs among the bodies of several Army troopers. Despite Palmer's reluctance to make a run across the open for the Warthogs, John manages to convince her squad to take the chance. The Marines eliminate several Kig-Yar Snipers to get to the Warthogs, and escape through the Kilindini Park with John, Palmer and PFC Sullivan on an M12G1 Light Anti-Armor Vehicle, and the rest of the Marines following on a M831 Troop Transport. After traversing the city's industrial zone via the Mwatate Street Transit Center and Shimanzi Road, the Master Chief reunites the Marines with the rest of their unit at their command post in the Palace Hotel at Beria Plaza, and goes to meet with their commanding officer. John discovers that the lieutenant is Parisa, a childhood friend from Eridanus II, who believed that he had died when in fact he was abducted for the SPARTAN-II Program. 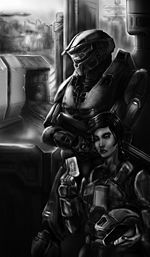 John briefly considers revealing his identity to her, but realizes that doing so would show that the UNSC was willing to kidnap and experiment on children to ensure its survival. Instead, he and Parisa begin to plan for the upcoming battle against the remaining Covenant forces, including the Scarab.